We've all seen the classic Ping Anser 2 shape. It's the one that almost all modern putters are based upon. Tiger Woods' Scotty Cameron and Nike putters are based on the Anser. In fact, this is the putter that Woods used to win his US Amateur titles and a few of his professional wins. The list of putter manufacturers who have an Anser-shaped model in their line up includes Odyssey, TaylorMade, Never Compromise, Yes. The Ping Anser 2 is not the original Anser, but it is the first to combine the heel and toe weighted design with a stainless steel construction, giving you the silvery finish which is most common today. The Ping Anser 2 is quite simply a thing of beauty. The parallel and perpendicular edges of all parts of the design give it the clean look we have all almost grown to think of as standard. Everything about the shape of the head gives you confidence that you can aim the putter easily and that the ball will come off the face in a parallel direction to all those straight lines. The silvery finish gives you the impression of softness, too. Never having owned a Ping Anser 2 I was keen to know what they feel like. What was it that Mark O'Meara felt when he won the Masters and British Open in the same year, and what was the sensation Tiger had holing all those putts as an amateur. Unfortunately I was disappointed. Rather than the soft contact I was expecting, the feel was remarkably hard and clicky. Compared with today's insert putters with their super soft face materials, the Ping Anser II is a major disappointment. This was the Ping Anser 2's major plus point. The roll I achieved from it was so noticeably "end over end" and so true that I almost felt like Tiger on the greens. 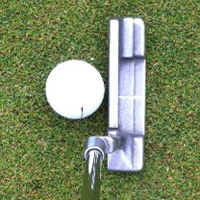 It feels like the kind of putter that would not let you down when you're on a hot day - every putt would likely roll well. Karsten Solheim, founder of Ping and designer of the Anser shape, incorporated around 4 degrees of loft into all of his designs, having seen that less loft actually cause the ball to bounce soon after coming off the clubface as the first impulse of the ball with 0 degrees of loft is actually into the grass, which causes the bounce. With today's far shorter greens (in general) than back in the 1950s and 60s when Solheim was designing his putters, many people argue that we need less loft, especially if you strike your putts noticeably on the upstroke. On the other hand, having 4 degrees of loft still has its fervent supporters. Putting gurus Stan Utley and Dave Stockton both say that having seeing this amount of loft on the putter face forces you to keep your hands ahead of the ball at impact, which they claim is the optimal position. The Ping Anser 2 is an absolute classic. Despite all the innovation in putter design, the Anser shape is still one that putter brands other than Ping always turn to because it's both forgiving on off-center contacts and attractive to look at. The only downside to the Anser 2 is the feel off the face which is quite a bit harder than many of the more modern versions on the market. The Ping Anser II putter is one of the most successful putters in the PGA Tour, winning major championships in the hands of Payne Stewart and Mark O'Meara. Not sure if a Ping Anser 2 is for you? Click here for our article on choosing a putter to fit your stroke.